Portugal and France will battle it out to see who will become the European Champions. They also examine how each team got to the final, how their players have performed in the tournament so far, capping off the podcast with a prediction of the final to see who will come out as the new European Champions. 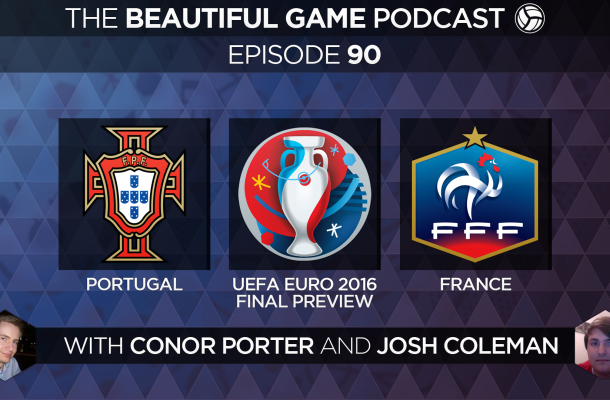 ‘The Beautiful Game Podcast’ is a podcast that highlights and discusses everything to do with the beautiful game. Or just search ‘The Beautiful Game Podcast’ on those sites. Please like and subscribe to us on iTunes and to our SoundCloud and YouTube channels!!! We can talk about anything football related you like on the podcast. All you have to do is ask, and you can do that in several different ways. or search ‘The Beautiful Game Podcast’ on those sites.